This was the home of writer Lillian Smith (1897-1966), best remembered for her groundbreaking first novel, Strange Fruit (1944). Though it sounds like pulp fiction with homosexuality as its theme, Strange Fruit was actually a tale of miscegenation, which was turned down by seven publishers before eventually reaching print. The novel was banned in cities like Detroit and Boston for its realistic treatment of the controversial theme. Despite that (or more likely because of it), the book was a runaway best-seller, which sold three million copies and was translated into 16 languages. Smith was a white woman with a lifelong interest in racial issues. When she was growing up in Jasper, Fla., her parents took in a foster child they believed to be a white orphan, only to find out she was part black. The girl was immediately sent away, and the cruel incident left a lasting impression on young Lillian. Besides Strange Fruit (in which Jasper was thinly disguised as Maxwell, Ga.), Smith published five nonfiction books on the topic of racial justice, and numerous articles in Redbook, The Saturday Review, and The Nation. 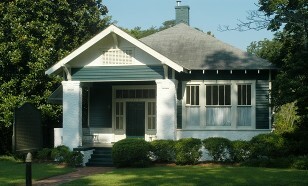 The Smith family moved from Jasper to Clayton in northern Georgia in 1915. Smith met her life partner, Paula Snelling, when the two helped run the Smith family’s summer camp, Laurel Falls Camp for Girls, on top of Old Screamer Mountain. Beginning in the 1930s, the two women collaborated to publish a magazine called Pseudopathia, devoted to reviewing literary works by African Americans. 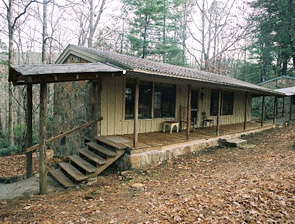 Today, the home where Smith did much of her writing is the Lillian E. Smith Center for Creative Arts, a compound of several cottages that accepts writers, artists, and other creative types for retreats at a small weekly fee. The center is run by Smith’s niece, a former professional dancer. Gertrude Pridgett / Ma Rainey (1886-1939) was born in Columbus to parents who were minstrel performers, and she began her own singing career at the tender age of 14 at the local Springer Opera House. She went on the road in 1902, and two years later married Will Rainey (nicknamed “Pa”), who led a touring company called the Rabbit Foot Minstrels (billed as “The World’s Most Famous Colored Show”). Although her marriage didn’t last long, Rainey herself enjoyed a 30-year career, and through her live performances and recordings became a nationally recognized blues singer nicknamed “Mother of the Blues.” In 1935, she retired to this house, which she had built for her mother; she is buried in the town’s Porterdale Cemetery. Once endangered and almost demolished by the city, Rainey’s house was saved through an arduous fundraising process. It has been lovingly restored, and is now open to the public. They must have been women ’cause I don’t like no men. They sure got to prove it on me. Ninety miles south of Atlanta, this site was used for the filming of Fried Green Tomatoes, the 1991 big-screen version of Fannie Flagg’s novel, starring Mary-Louise Parker and Mary Stuart Masterson. Originally a general store, it was transformed for the movie into a 1920s café. After the movie was released, the location spot became a tourist attraction (I picture busloads of dykes descending on the small town), and the owners decided to capitalize on its popularity by turning it into an actual café. In Flagg’s novel (she herself is a lesbian), café owners Idgie and Ruth were a couple, but the Hollywood version blurred the lines of their relationship (at least for straight audiences; gay viewers knew what was what). Still, the film has some clear lesbian moments – as when young Idgie dresses in boy-drag for her sister’s wedding – making it a lesbian classic. Carson was not popular in school – she was withdrawn and cared little about her clothes or appearance – and she was taunted by other girls as being “freakish” or “queer.” She never dated boys until she met Reeves McCullers, a soldier stationed at Fort Benning, in the summer of 1935. Reeves courted Carson at the Starke Avenue house, bringing her mother flowers and candy – and beer and cigarettes for Carson – and they married here two years later. Carson and Reeves had a stormy relationship, rife with drama, that ended finally with Reeves’ suicide. Both were bisexual and at one time were in love with the same man, composer David Diamond. Carson‘s mother lived in this house until her husband’s death in 1944. Plagued by illness throughout her life, Carson frequently returned to Columbus to recuperate under her mother’s care. Eventually, mother and daughter lived together in Nyack, N.Y., in a house bought with the money from the sale of the Stark Avenue house. The house is now open to the public by appointment (706-327-1911); it also operates as an artists’ retreat, offering residencies to writers and musicians.